A diffuser is "a device for reducing the velocity and increasing the static pressure of a fluid passing through a system”. Diffusers are used to slow the fluid's velocity while increasing its static pressure. The fluid's static pressure rise as it passes though a duct is commonly referred to as pressure recovery. In contrast, a nozzle is often intended to increase the discharge velocity and lower pressure while directing the flow in one particular direction. Frictional effects during analysis can sometimes be important, but usually they are neglected. Ducts containing fluids flowing at low velocity can usually be analyzed using Bernoulli's principle. Analyzing ducts flowing at higher velocities with mach numbers in excess of 0.3 usually require compressible flow relations. A typical, subsonic diffuser is a duct that increases in size in the direction of flow. As the duct increases in size, fluid velocity decreases, and static pressure rises. Both mass flow rate and Bernoulli's principle are responsible for these changes in pressure, and velocity. A supersonic diffuser is a duct that decreases in size in the direction of flow. As the duct decreases in size, fluid temperature, pressure, and density increase, while velocity decreases. Compressible flow is responsible for these changes in pressure, velocity, density, and temperature. Shock waves may also play an important role in a supersonic diffuser. When possible, dampers, extractors, and other flow control devices should not be placed near diffusers' inlets (necks), either not being used at all or being placed far upstream. They have been shown to dramatically increase noise production. For as-cataloged diffuser performance, a straight section of duct needs serve a diffuser. 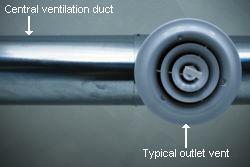 An elbow, or kinked flex duct, just before a diffuser often leads to poor air distribution and increased noise. Diffusers can be as a shape of round, rectangular, or can be as linear slot diffusers(LSDs, e.g. : Linear slot diffusers takes the form of one or several long, narrow slots, mostly semi-concealed in a fixed or suspended ceiling. Occasionally, diffusers are mostly used in reverse fashion, as air inlets or returns. This is especially true for Linear slot diffuser and 'perf' diffusers. But more commonly, grilles are used as return or exhaust air inlets. ^ "diffuser". Merriam–Webster Dictionary. Retrieved 5 August 2016. ^ "Mach Number". NASA. National Aeronautics and Space Administration. Retrieved 5 August 2016.